6 x 9, 376 pp. In Software Abstractions Daniel Jackson introduces a new approach to software design that draws on traditional formal methods but exploits automated tools to find flaws as early as possible. This approach—which Jackson calls "lightweight formal methods" or "agile modeling"—takes from formal specification the idea of a precise and expressive notation based on a tiny core of simple and robust concepts but replaces conventional analysis based on theorem proving with a fully automated analysis that gives designers immediate feedback. Jackson has developed Alloy, a language that captures the essence of software abstractions simply and succinctly, using a minimal toolkit of mathematical notions. This revised edition updates the text, examples, and appendixes to be fully compatible with the latest version of Alloy (Alloy 4). The designer can use automated analysis not only to correct errors but also to make models that are more precise and elegant. This approach, Jackson says, can rescue designers from "the tarpit of implementation technologies" and return them to thinking deeply about underlying concepts. 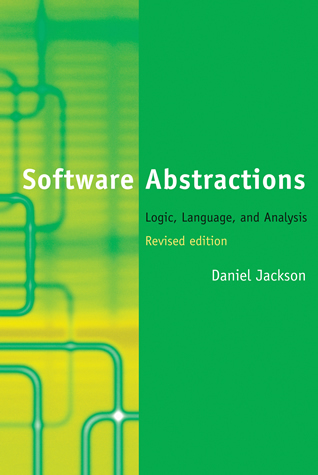 Software Abstractions introduces the key elements: a logic, which provides the building blocks of the language; a language, which adds a small amount of syntax to the logic for structuring descriptions; and an analysis, a form of constraint solving that offers both simulation (generating sample states and executions) and checking (finding counterexamples to claimed properties). Daniel Jackson is Professor in the Department of Electrical Engineering and Computer Science and leads the Software Design Group at the Computer Science and Artificial Intelligence Lab at MIT.